With the revised Dementia Friends materials for Black, Asian and Minority Ethnic communities, I grabbed the opportunity to deliver a Dementia Friends Information Session to our Reminiscence Tea House support group. Gill Tan and Tom Lam, the project co-ordinators for the group, helped me to review the materials and made sure that the language still conveys the same messages in translation. I ran a Dementia Friends Information Session to them beforehand so they became Dementia Friends and could understand the session fully. I don’t speak fluent Chinese, so in this instance we used a translator but ideally it’s important to speak the language of the group rather than use translators. We tried to keep the sessions simple but lively. Especially as our last sessions were in strong competition with the mah-jong group which was held at the same time! The Chinese Dementia Awareness and Support Project has a new less stigmatising word ‘Tui-Zhi-Zheng” which we used in the translation for dementia. 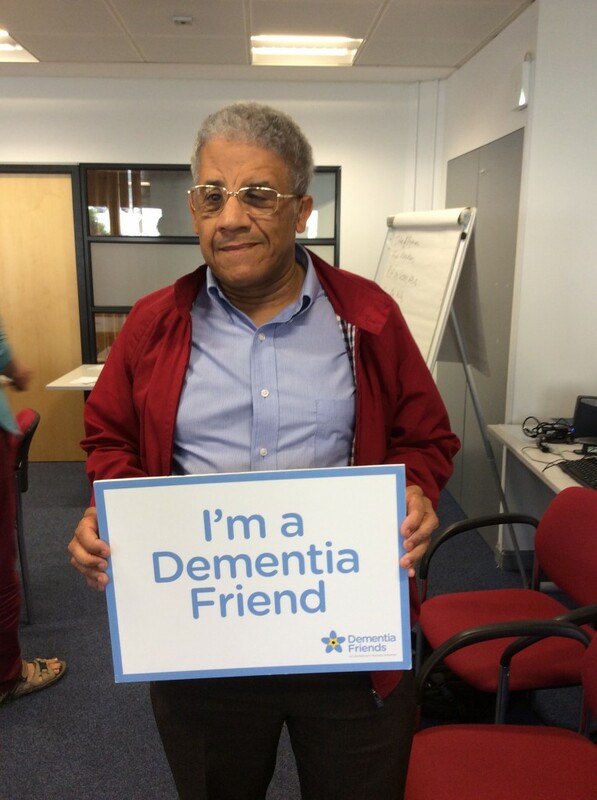 In the Dementia Friends sessions Gill used a brief call and response routine to help people get used to the word. The Dementia Quiz was great at carrying the 5 messages to the audience. People raised their hands for ‘yes’ and ‘no’ responses and Gill translated their comments. This went down well and seemed to keep the mah-jong players with us! So far we have delivered four Information Sessions for four different Chinese community groups, creating about 70 Dementia Friends and receiving excellent feedback! I will continue to feedback on using the BAME materials and helping to make Dementia Friends as accessible as possible. Are you a Champion? Download the BAME resources from your dashboard now. Hi. I will be attending a training soon to become a Dementia Friends Champion. I am planning to deliver the session in the Chinese Community in Derby after I complete the training. I am aware that we have to provide the infocards and action mailers to the people who want to become a Dementia Friend. May I know are those available in Chinese? Or I need to translate it on my own? Hi Vivian – many thanks for your message. Great to hear you are going to be trained as a Champion and are looking to deliver Sessions for the Chinese community! Once trained, you’ll have access to all our resources, included our BAME resources. These have lots of tips and advice on delivering to audiences who may not speak English, so i’m certain they’ll help you with your Sessions. In terms of the infocards/mailers themselves, we do not have these available in translation i’m afraid. However, the BAME resources have advice on where you can signpost people to for further support and info and links to info available in other languages. If you have any further questions please don’t hesitate to email us at dementiafriends@alzheimers.org.uk or speak to the Regional Support Officer on the day of your training. May I know how the author translate “people living with dementia” into Mandarin? I am struggling to find a proper word with that. Can you tell me if you have resources to deliver dementia friends session to the travelling community? if so could you let me know more about it please..